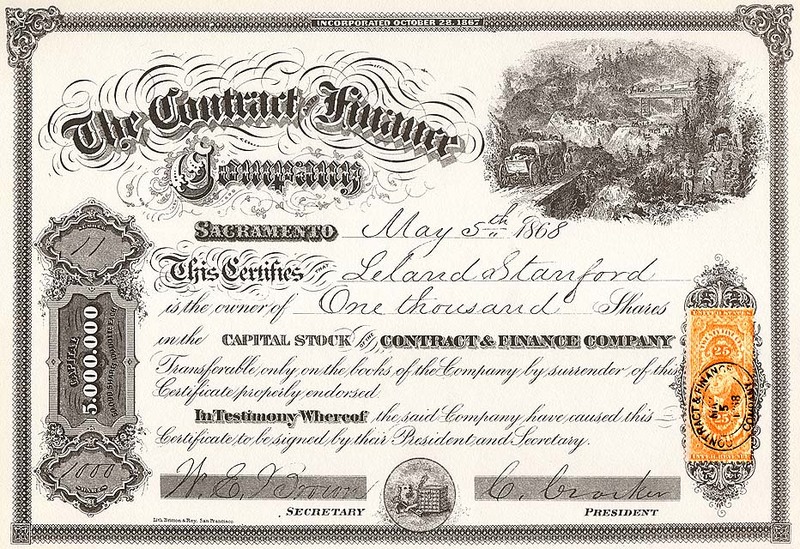 The above reproduction of Stock Certificate number 11 of the Contract and Finance Company is one of at least ten (numbers 11, 12, 13 , 14, 15, 16, 17, 18, 19 and 20, each for 1,000 shares) owned by Leland Stanford. These shares passed into Stanford's estate on his death and are signed on the back by Jane L. Stanford, his widow and executrix of his estate. Through Mrs. Stanford almost all the Stanford property came to the University. These stock certificates along with the Stanford letters and papers, came to the Stanford Collection, which later became the Stanford University Archives. The Contract and Finance Company was the construction company created by Stanford Huntington, Hopkins and Charles and E. B. Crocker on October 28, 1867, to succeed the financially exhausted Charles Crocker and Company. The new company was to complete the construction of the Central Pacific Railroad from the California-Nevada border to the junction with the Union Pacific Railroad. There seem to have been two other related reasons for creating the Contract and Finance Company. Financing was difficult, as the railroad was mortgaged and in debt; and new partners were needed to bring in additional money. It was hoped that, by creating a new construction company that would acquire the railroad's assets in return for building, this end would be accomplished. This was not to be the case. (Leland Stanford later stated: "We did not succeed in any quarter in interesting others and finally gave it up.") Huntington had telegraphed to Crocker: "Take as much as you are forced to but as little as you must." In the end, each of the Associates took a fifth interest. It was an improvement over the Charles Crocker and Company arrangement in which all but Crocker were silent partners. Under the new arrangement, each would legally share assets in proportion to his investment. The contract granted to the Contract and Finance Company provided for construction and all necessary equipment for the railroad (depots, locomotives, cars, machinery, purchase and installation of rails, ties, etc.). Payment was to be $43,000 cash per mile and an equal amount of Central Pacific stock. With the success of this venture, the basic plan behind the Contract and Finance Company was expanded and used in the formation of what culminated in the gigantic holding company, the Pacific Improvement Company. This is Number One of twelve Keepsakes issued during 1969 to its members by The Book Club of California in commemoration of the centennial of the transcontinental railroad. The series has been edited by David F. Myrick and designed and printed by Lawton and Alfred Kennedy. The certificate is reproduced through the courtesy of Stanford University. Patricia J. Palmer is Manuscripts Librarian at Stanford. Courtesy The Book Club of California.